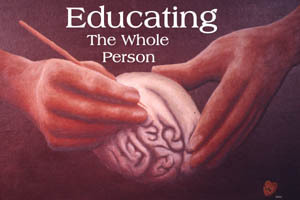 My interest in mind/body and chi awareness came as a result of a learning disability. I was acing my tests at school, 4.0 average, but I could not understand what they were teaching me. I was memorizing text, but you need images as well as text to build a foundation of knowledge. While meditating and traveling inside my brain I came across a tiny area in the brain generating a peaceful signal. I did not create this signal, I just became aware of it. While being aware of this spot I had incredible ease in having images showing up. If I moved away from this spot I no longer had access to images. After a month of daily enjoying images showing up I noticed an image of my house and instead of just seeing it I started walking toward the house. Can you imagine how amazing it felt to turn a two dimensional image into a three dimensional hologram. The next thing I learned, is that when I paid attention to the small area and opened my eyes, everything I saw looked sharper. This increase in visual acuity is typically attained by an increase in body tension. Now there was a way to have greater visual abilities while your body was relaxed. I asked myself, "How will I ever be able to teach this?" I found out that if I just articulated how I did the traveling the person listening and following my direction would have the same experience. Since I could not teach this, and people did not have the skill to implement what I was instructing them to do, I had to conclude that we an an internal intelligence inside of us that makes the traveling experience possible. I am a clairvoyant. I can see chi energy, which looks like thick water. It's like having access to a special skill that allows me to notice things other people don't. That's what I used to believe. Now I know that everyone has the same ability as I do. I'm just more determined to use it and be aware of it as it gives me greater understanding of myself and the world around me. I would like to share these and other amazing discoveries I have made about intuition, Life Human Energy and the value of being an chi energy sensitive person. Choose the page you want to go to 1 Energy That Travels 2 Why Learn About Traveling Energy. 3 How the Brain Reads. 4 Brain Pulses Creating Content.